Constructed in 2016, this state-of-the-art facility was designed to be environmentally and fiscally sustainable, maximize cow comfort, and bring ease of use to the forefront of daily activities. The Facility consists of two open bedded cow barns, a hay storage barn, a veterinary barn, and a heavy duty corral system. The cow barns consist of a general bedding space, calf creep feeding pen, and feed area. Each barn has an attached courtyard to double the living space of the barn. The hay barn has storage capacity for two years of hay and bedding, as well as an alley that runs the length of the barn. The veterinary barn houses a cattle working space, and an office. The vet space is comprised of working equipment that includes an adjustable alleyway with a scale, squeeze chute, and supply storage. There are four stalls for birthing cows, with a loft above the stalls for bedding and feed storage. The lighting throughout the facility inside and out is highly efficient LED. The corrals are strategically placed to allow the easy movement of cattle from their bedded barns to the veterinary barn. This system has three alleys, two large pens, and eighteen 12'x12' pens for sorting. Benefits of these barns include improved cow comfort, improved cow cleanliness, the low maintenance nature of the system, improved feet and legs, decreased somatic cell count, increased heat detection, ease of manure handling, increased production, increased longevity, low investment costs, less odor, fewer flies, less concern with cow size, and improved manure value. The feeders contain an internal cradle that holds a square or round bale off the ground. 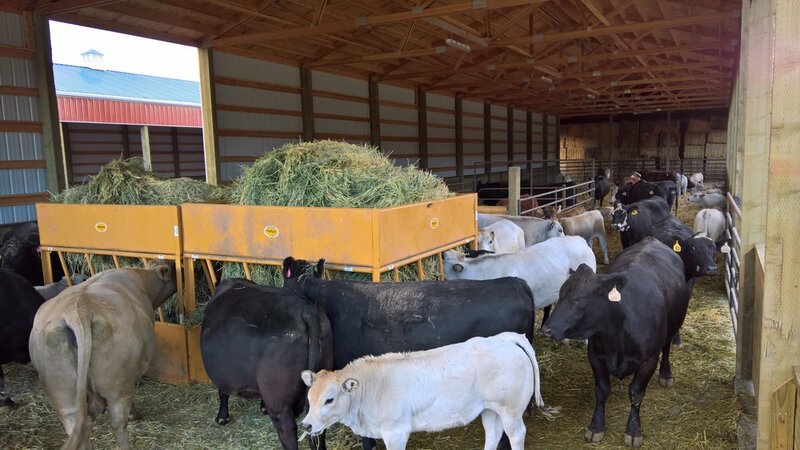 The cows are able to reach in and pull hay from the bale, and any hay that they drop remains inside the secondary feeder wall. This cuts down the average waste by 75%. Throughout the open bedded barns, and the stalls in the vet barn are security cameras with night vision. These cameras allow us to check on cattle from the on site office, home computers, and smart phones. This covered alleyway allows for calm and easy movement of cows and calves between barns, and the corrals. The stamped flooring increases traction which helps reduce injuries. This is an all around great squeeze chute. Starting with the parallel squeeze action that keeps the animal upright, rather than pushing them off balance to one side. The floor of this chute has Rumbar (rubber composite) flooring for extra traction. An extra-large palpation cage makes A.I. and E.T. work for the vet easy, and if I need to assist on a birth and pull a calf I have plenty of space. The optional neck-extender and removable brisket bar have already come in handy. Finally, the full side opening doors on both sides have additional swing out nursing doors to assist with calves that need a little help getting started. You can learn more about the chute, adjustable alleyway, and tub system by watching the videos in the links below.